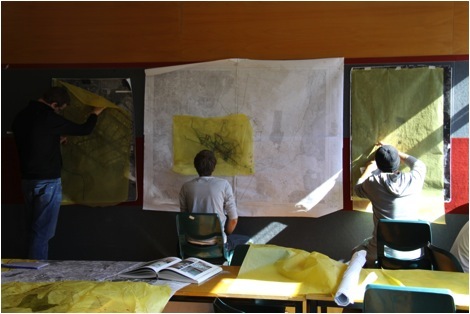 The National Institute for Experimental Arts is presenting a HotHouse Workshop on Ecological Thinking on the 19 and 20 May, 2011. The event will include talks from international keynote speakers Tim Morton and David Gissen. The workshop will consider ecological thinking and how it transforms the way we understand materials, objects and environments, whilst asking how we might radically rework ecological thought and curate (care for) Tim Morton’s concept of hyperobjects. Participants are invited to brainstorm about a future exhibition project on hyperobjects for the new gallery complex at the College of Fine Arts. For further information on this event including times and ticket prices please visit the Materials: Objects: Environment page. 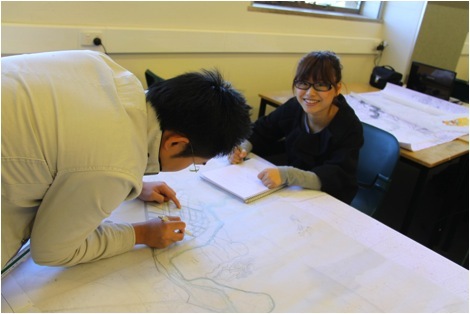 Our 2010 UNSW Built Environment Graduand Catalogues have been released for viewing. These catalogues showcase the achievements of our 2010 of our graduating students – congratulations to all those involved. If you would like to view the various graduand catalogues, please click the links below. The year is 2030, and the city’s population has just exceeded 6 million. The metro carriages are due for replacement, Central Park’s tri-generation plant is operational and the new broadband network is reaching peak speeds of 9 gigabytes per second. 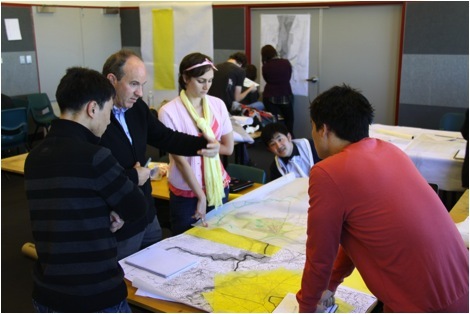 Using recent projects by architecture students from UNSW, UTS and the University of Sydney, along with key visions included in City of Sydney’s Sustainable Sydney 2030 plan, we follow in the footsteps of imaginary city dwellers as they explore Sydney in 2030 through a variety of graphic and video media. 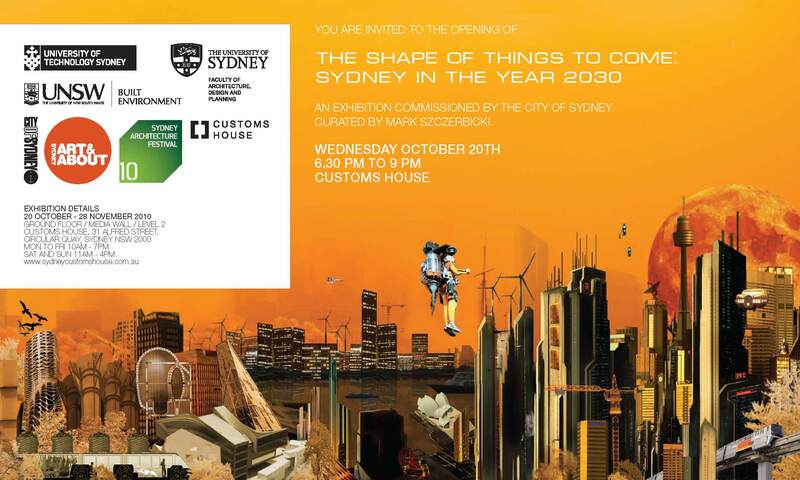 Commissioned by the City of Sydney and curated by Mark Szczerbicki, this exhibition is held in conjunction with the 2010 Sydney Architecture Festival. 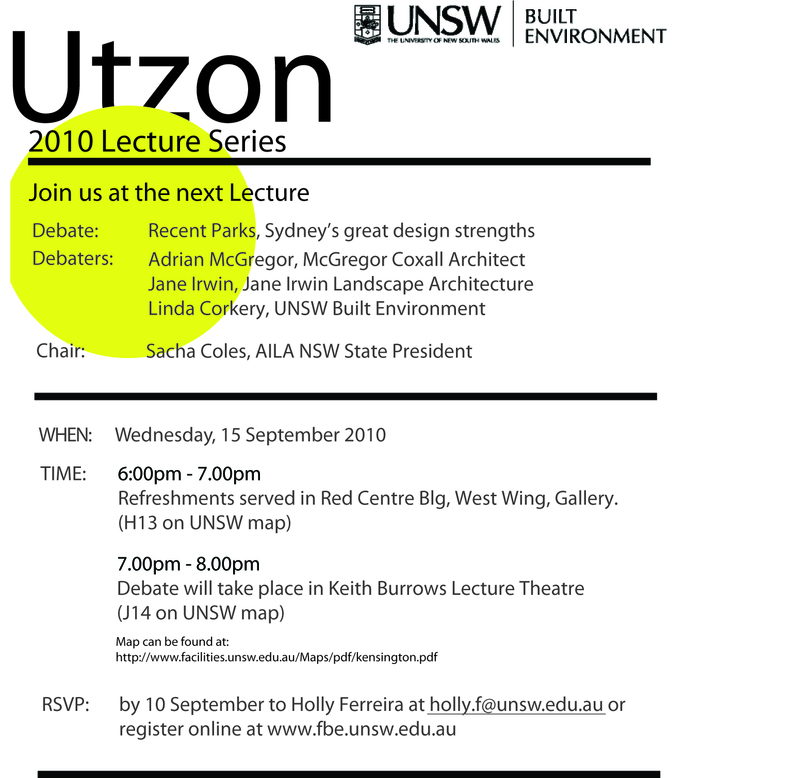 Tomorrow night is the next installment in the UNSW Utzon Lecture Series “Recent Parks, Sydney’s Great Design Strengths”. Click here to register! The presentation will focus on 3 scales – The Metro, The Regional, and the Local. A presentation of contemporary parks and public space projects will be used as the thread which links these scales and describes why they are fundamental to achieving a public domain which provides social, cultural, economic and environmental nourishment to the city. The Speakers will cover the following areas. Speaker 1 – Linda Corkery – Open space at the metro scale. Linda will present on Metro Parks as the Green infrastructure of the city. Her talk will cover the social imperatives of ensuring public access to healthy environments and how the aesthetic and visual qualities of these parks and places give shape to the surrounding urban form. Speaker 2 – Adrian McGregor – The Waterfront Transformation. Adrian’s presentation will look at how the translocation of fossil fuel land uses on the city waterfront have lead to the remediation of post industrial sites for community recreation and environmental restoration. Adrian’s talk will look in detail at two of McGregor Coxall’s recent projects in Sydney. Speaker 3 – Jane Irwin – The Local. Jane will present on the value of the local network of parks and spaces that provide social spaces and opportunities for enriching life in the city. 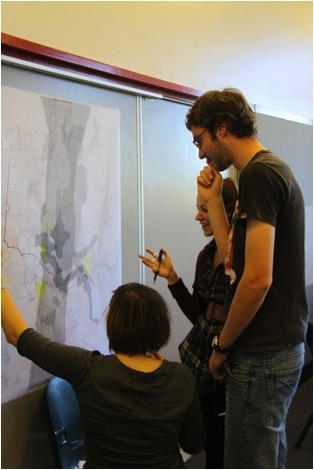 Jane will focus on recent public projects from her office from Auburn to Camperdown. The second half of the semester has become slightly more intense and I’m finding I’m not so much sleeping like a baby anymore. Design studio has really bumped up a notch. 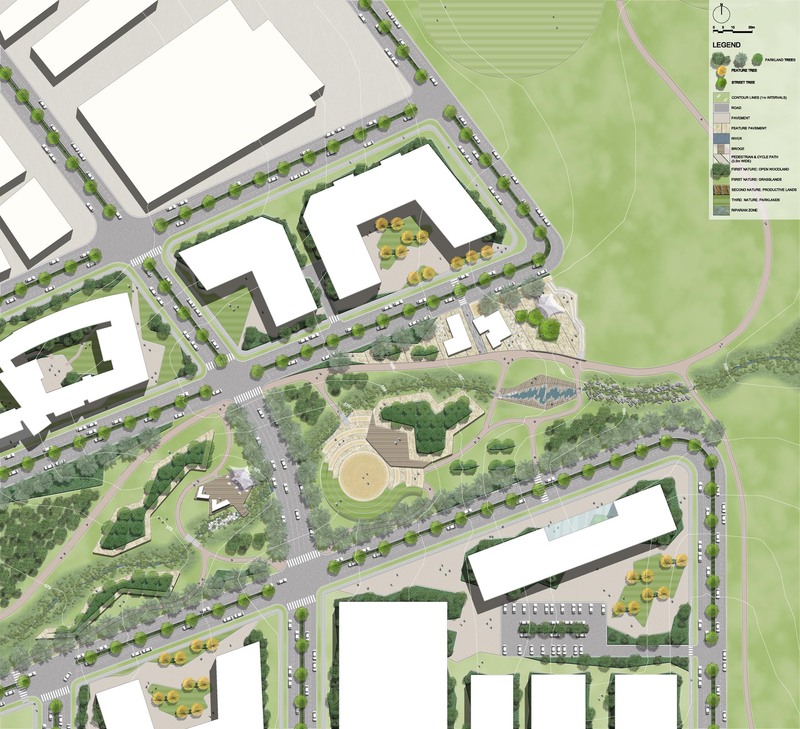 It is one thing to analyze existing site conditions as we did for the first part, now using this information to inform design process is something slightly trickier. 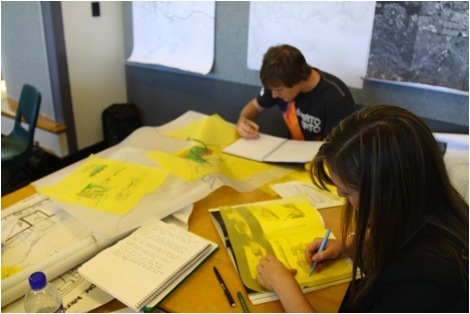 I think group work is a great experience and really does test people. It can become very interesting at times, especially in design where it is so individual and opinionative. Nether the less it’s all about preparation for non uni life. Some amazing work has been produced, as we reach the final stages of the design process you can see different group ideals coming through strongly in their work. 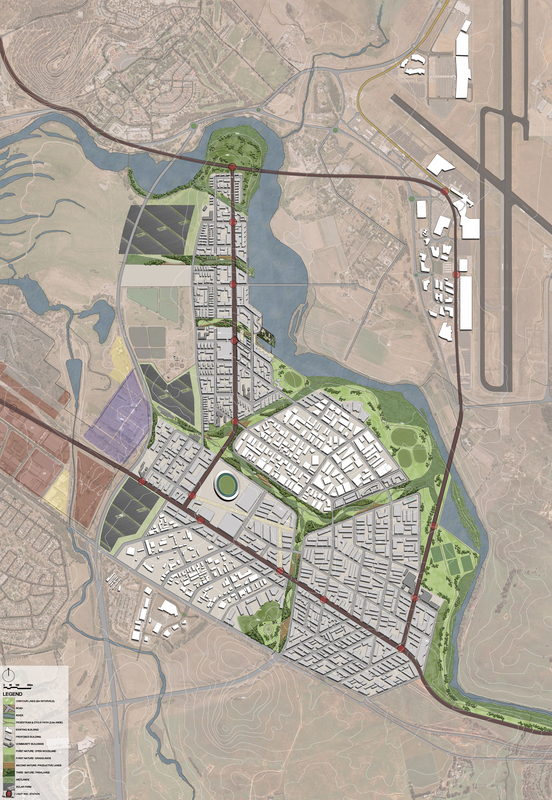 It is evident that every group has a different spin on what has been initially proposed. I think everyone is looking forward to the break, hopefully it will give me some time to write a significant chunk of my thesis. After the break we have our trivia night which will raise funds for our graduation exhibition. I urge you all to get involved, would be a good chance to mix with the other years and a number of professionals from the industry. Look out for the invites!